The National Archives, with its amazing collection of American history, has been in the news (at least in The Washington Post!) quite a bit lately – but for all the wrong reasons. One amateur historian’s mistake should not, however, stop you from paying a visit if you’ve never done so before. Last week, I visited the Archives for the first time. Did you know that in addition to the building located on Pennsylvania Avenue (that’s where you’ll find the U.S. Constitution, the Declaration of Independence, and the Bill of Rights), there is also an incredible facility in College Park, MD? This is where all of the recent permanently valuable collections are kept. 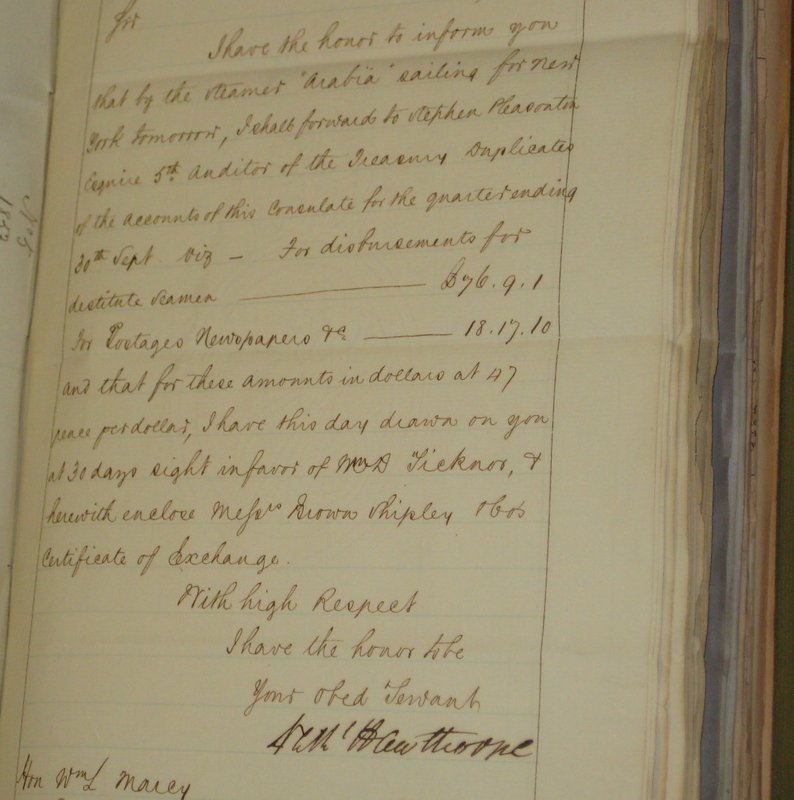 Keep in mind, the Archives collection numbers in the billions, so “recent” includes documents from the 1800s! I went to the College Park facility with some of my Consular Affairs colleagues to learn more about the State Department’s rich history. A diplomat’s job is not easy – it’s not all cocktail parties and social teas! Some of the items we saw illustrated the mundane nature of diplomatic life: inventories of items ranging from stamps to envelopes to paper. Not even U.S. Consul to Liverpool (1853-1857) Nathaniel Hawthorne would have been exempt from these! Other documents showed the trust Americans placed in our diplomats’ advice. We saw a letter from a young Jewish-American woman, written in 1934, asking the State Department for guidance. She had won a prestigious scholarship to a university in Germany. Her parents were worried for her safety. Would it be safe for her to go? We don’t know her decision, and that question haunted many of us. 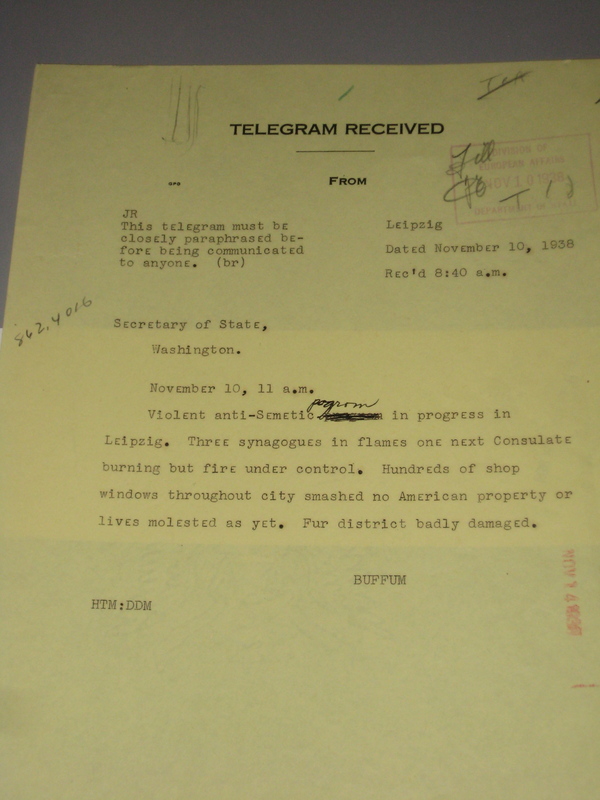 Diplomats overseas also provided on-the-ground spot reporting, such as informing Washington of the widespread violence occurring in Leipzig in November 1938. Today, we know the shocking events that followed. But what of those diplomats on the ground? Did they have any idea what was coming? Further research at the Archives is required. The National Archives are free and open to anyone who wishes to conduct research – which makes them unique among the world’s archives. We heard stories of foreign researchers coming to the National Archives who were shocked to discover that they could have access to any documents, films, photographs or other media in the building at no charge! Some even use the National Archives to gather information about their own country’s past. Americans should be proud of the Archives’ efforts to maintain our national history for future generations. Take some time to visit the Archives – whether to research your own personal history or our nation’s. You won’t regret it. Trader Joe’s: So many of my expat American friends talk about how much they miss Trader Joe’s or how happy they are to be back in the U.S. so that they can shop at Trader Joe’s. I do not get why this store is so beloved. What am I missing? I’ve shopped at TJ’s a few times – there’s one near my house. It was crowded, the aisles were narrow, and I just didn’t feel the love. Does everyone secretly hate Trader Joe’s but they don’t want to be the first to say it for fear of the backlash? Well, relax. I’ve said it. You’re welcome. Headlights: People, if it’s raining, snowing, foggy, dusky or if there is anything else going on that limits your visibility, you need to turn on your headlights! Jeez, it’s not rocket science. Skinny Jeans: Just – no. What aspects of American culture befuddle you? Shut Up and Drink Your Coffee! You know those people who are so particular about their coffee? The ones who only drink “organic beans blah blah” or who “grind their own yada yada” or “never drink that coffee.” Yeah, you know ’em: the coffee snobs. Who do they think they are? They’re not better than the rest of us. Hey! Coffee snobs: just drink the “regular” coffee like the rest of us and shut up. Coffee’s not that special, right? One blend/brand is as good as the next. I rarely drink coffee anyway – only if I’m cold and it’s the only warm drink available – so what does it matter? Then I moved to Rome. The Italians know how to make coffee. They get it. Italian coffee is…heavenly. It is rich and dark and smooth and…perfection. Espresso, cappuccino, macchiato, caffe latte – it doesn’t matter; a good Italian barista knows exactly how to make it. After three years in Rome, I had a routine: caffe latte at the Embassy in the morning to kick-start my day, and a macchiato after dinner. Perfetto. The bliss of walking into my neighborhood cafe – the place where the barista knows me so well that he’s started to prepare my coffee before I can even say “buon giorno.” He puts the glass (caffe latte should always be served in a glass, you know) on the bar in front of me. 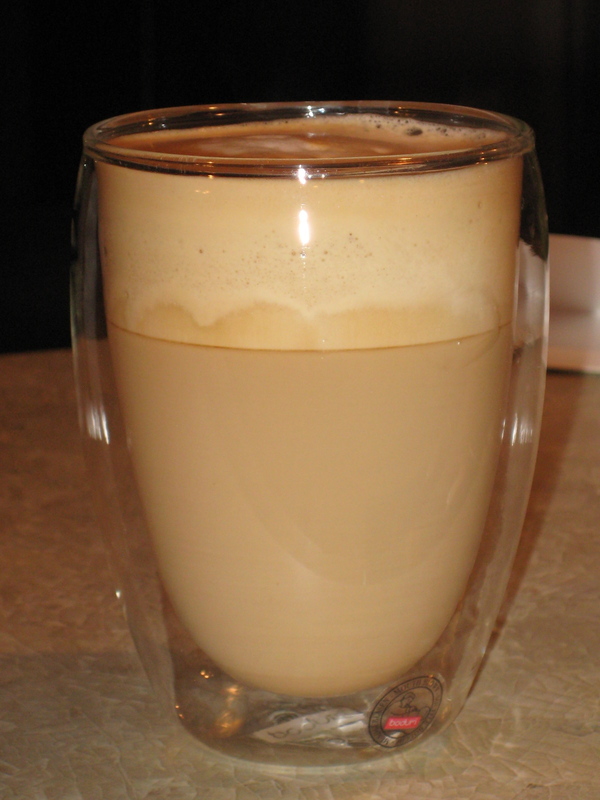 It is the perfect blend of strong coffee and steamed milk. I take the first sip and I realize I can survive – nay, I can conquer – the day. I am strong, I am smart, I am independent. Cables to clear? Briefing memos to write? Fourth of July celebrations to plan? Bring it. I have had. my. coffee! Never again would I drink the thin, watered down, weak swill that passes for coffee in the United States. You call that a cappuccino? Please. I will drink nothing less than a rich, dark coffee brewed from freshly ground beans and distilled water, served with milk steamed to perfection and poured gently into oh my God – I’m a coffee snob. 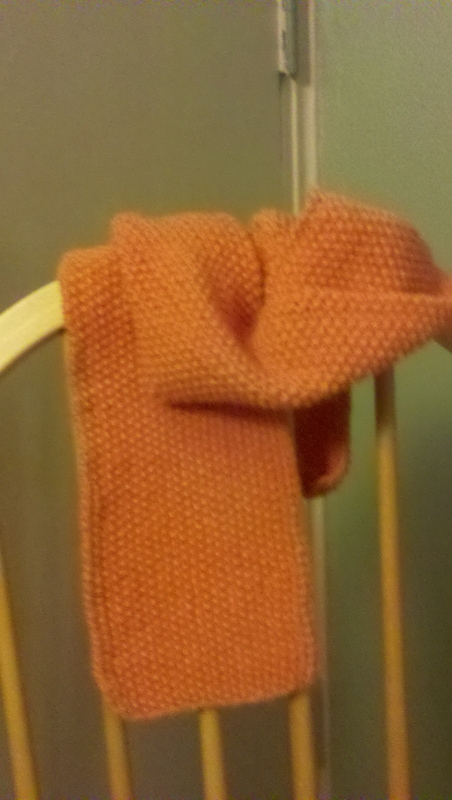 I completed my first knitting project: a scarf. 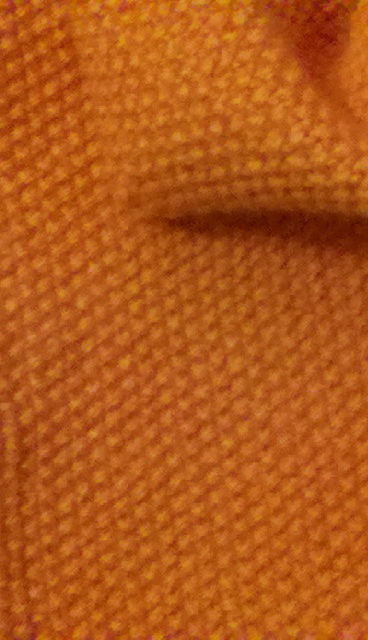 Not a dropped stitch in sight! And anybody who knows me know that I love to eat. There are few things I will pay a lot of money for: comfortable shoes, a good massage, and a damn good meal. When I lived in Rome, it was like my part-time job. I kept a little book that I filled with business cards from restaurants and trattorias that had fed me well. So last week when I saw the full-page ad for DC Restaurant Week in the Washington Post, I started salivating. Restaurant Week is an excellent way to try restaurants that might ordinarily be out of your price range. Here’s how it works: participating restaurants offer set lunch and/or dinner menus at a set price. For example, for dinner you pay $35 for a three course meal not including drinks. I don’t really have the time, inclination or cash flow to visit a different restaurant every night, but I did manage to make time for one new one this week: Ten Penh. Ten Penh calls its cuisine “Asian fusion,” but I think it was a little short on the Asian. My meal – spring rolls, Chilean sea bass, and chocolate cake – was good, it just wasn’t fantastic, you know? It was great to try something new, but I don’t have any desire to go back. Have you “done” DC Restaurant Week? DC is a great town; it really is. There is so much to do, so much to see. The problem, sometimes, is that this is a town full of eager young kids fresh out of college. Generally speaking, that’s great. They have lots of energy, they are willing to work long hours, they fill up all those group houses. The downside is that they populate a lot of the area watering holes – and many of those watering holes tend to cater to that demographic. I graduated from college in 1992, okay? I don’t want to be picked up in a bar. I don’t want to be splashed with some random guy’s (or girl’s) beer. And I don’t want to have to shout to be heard. There has got to be a bar or two that meets those criteria. I find that it’s always good to have a few go-to bars. You never know when you might need to decompress from a tough day at the office, celebrate a friend’s good news, or have a secret rendezvous. If only! In Rome, there were a number of excellent rooftop bars near the U.S. Embassy. In fact, my friend Dave made a point of hitting them all before he left Rome for good. I was his wingman on occasion. I work in the Foggy Bottom area now and, despite the fact that we are surrounded by George Washington University, I think the grown up bars are few and far between. Yes, there’s Tonic, but – see above. What’s your favorite bar for grown ups? Recommendations welcome! We always had pets growing up – an Irish setter named Rusty, a calico cat named Coco, a cocker spaniel named Flossie. I loved those dogs, but there is a special place in my heart for cats. A few years after I graduated from college, I decided I was ready to bring a cat into my life. 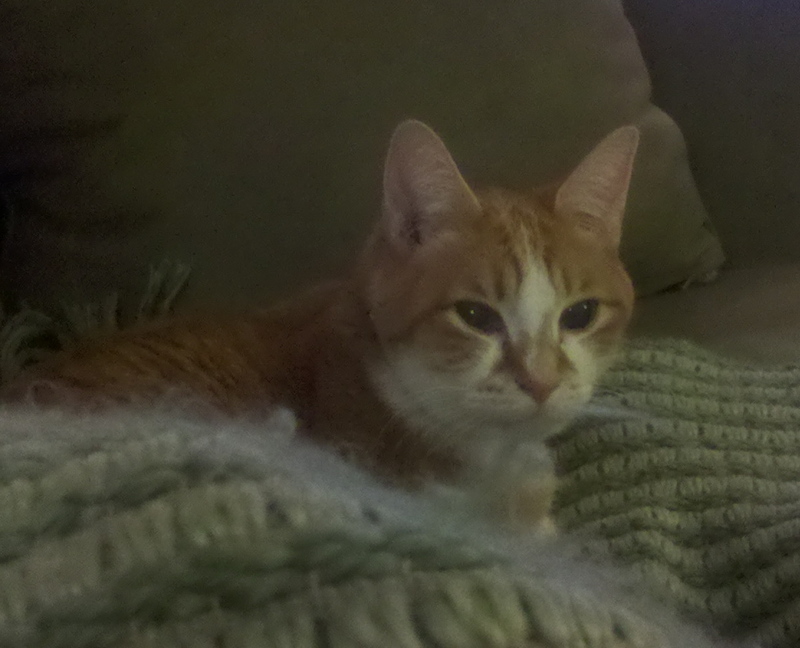 I adopted a tabby from the local shelter and named her “Lope.” What a great cat! It was so great to walk into the apartment and be greeted by Lope – she was always happy to see me. We had wonderful adventures together. One Christmas, she and I drove from Atlanta to St. Louis to spend the holidays with my sister. Lope rode in my lap most of the way. Then she gamely tagged along when I moved from Atlanta to Raleigh, NC and again when I moved from Raleigh to Washington, DC. We drove to Pittsburgh together to visit friends. Lope also committed to the Foreign Service life. I bought the regulation airport-approve carrier, she jumped in, and off we went to Albania. Then we did the same thing going to Belize. She loved it there. The sun was always shining and there were plenty of geckos for her to play with! Lope was about 15 or 16 years old by the time we got to Belize – quite elderly in cat years. I was heartbroken when her kidneys began to fail. She was clearly not herself, so I let her go: I put her to sleep. I know that many people think of their pets as members of the family, so it really is hard when they die. Now imagine doing that in a foreign country – alone, no (human) family nearby. After Lope died, I decided that was it – no more pets for me. The Foreign Service life makes it a challenge and, frankly, I just didn’t think I could bear to go through the loss again. So there’s a new “man” in my life and I couldn’t be happier. I think this relationship might actually work out. I like to think of myself as an “arts and crafts” kind of gal – especially when I’m overseas. It’s nice to have a creative outlet, and it’s also a good way to connect with friends and colleagues. In Albania, I was totally into scrapbooking and watercolor. In Belize, three wonderful Chinese ladies offered macrame classes to my colleagues and me. In Italy, I took a few wine classes and devoted myself to photography. Sadly, these obsessions rarely stick. I wasn’t any good at painting, got bored with scrapbooking, I couldn’t macrame a keychain now if my life depended on it, and no one would mistake me for an expert on Italian wine! So now that I’m back in the DC area, I’ve found a new obsession: knitting. It’s not just for spinsters anymore. I first learned how to knit when I was about 10 or 11. My mom taught me. As I recall, I produced a lot of ratty scarves and one bright pink purse. (My grandmother sewed it together for me). But I haven’t knitted since and I wanted to get back into it. I have this fantasy that I’m going to become such a proficient knitter that I will be able to knit myself a dress! Crazy? Maybe, maybe not. Anyway, after a little research I found a beginner’s knitting class in Alexandria! First class yesterday. Knitting is for grandmas and spinsters, you say? You couldn’t be more wrong. Knitting became all the rage several years ago, so although I am late to the party, I am not alone. There are several knitting communities, stores, and classes in the metropolitan DC area. And there are many, many websites and online groups where you can find patterns, get help when you run into trouble, and commiserate with fellow knitters. I am not surrounded by blue hairs (not that there’s anything wrong with blue hair) in my class – this is a young sport, people! My fellow beginners included a young mom-to-be, a couple of singletons like me, and a mother-daughter team – all of us struggling to move 20 lousy stitches of yarn from one stick to another. That’s knitting in a nutshell. But you know what? It’s soothing. It’s fun. And I can watch TV while I’m doing it. So if you want to call me a spinster, fine. I’ll take it. I’ll be the one in the sweater dress with the ratty scarf and the bright pink purse. Don’t kid yourself; it ain’t baseball. It’s shopping. I have something of a love/hate relationship with shopping. Shopping online = love. Shopping at the mall = hate. 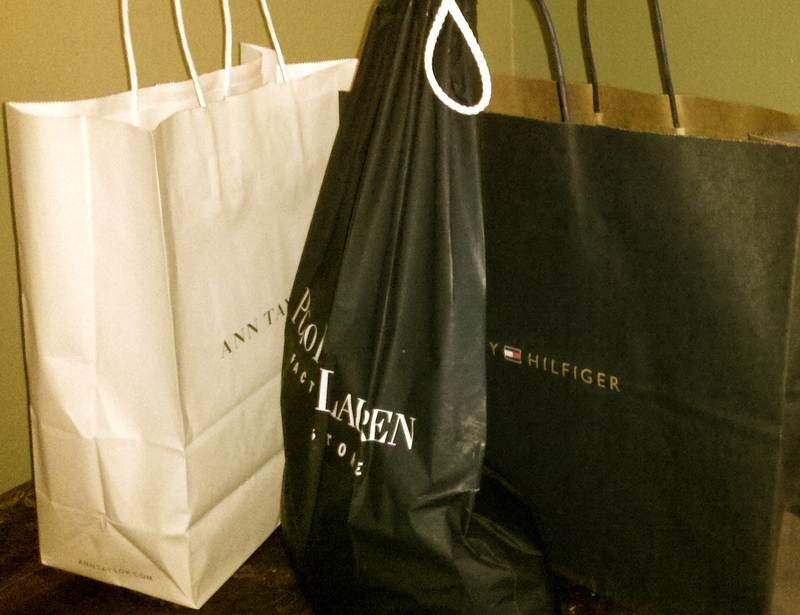 Shopping in the middle of the week during the day when everyone else is at work = love. Shopping on the weekend = hate. Shopping during the Christmas holidays = super hate. Shopping and shopping malls are so American. We like our malls big. We like to shop ’til we drop. We love a bargain. For me, shopping malls rank at the top of my hate-meter, but shopping in general isn’t far behind. Shopping on Via del Corso in Rome on the weekends was a nightmare. During the sales (January and July of every year), shopping on Via del Corso was a nightmare to the power of 10. Whether it’s a mall in suburban Virginia or the stores on Via del Corso, it’s the same. The crowds. The noise. The people who walk slowly and aimlessly (I always get stuck behind these people). Sigh. What’s your favorite outlet in the DC area? 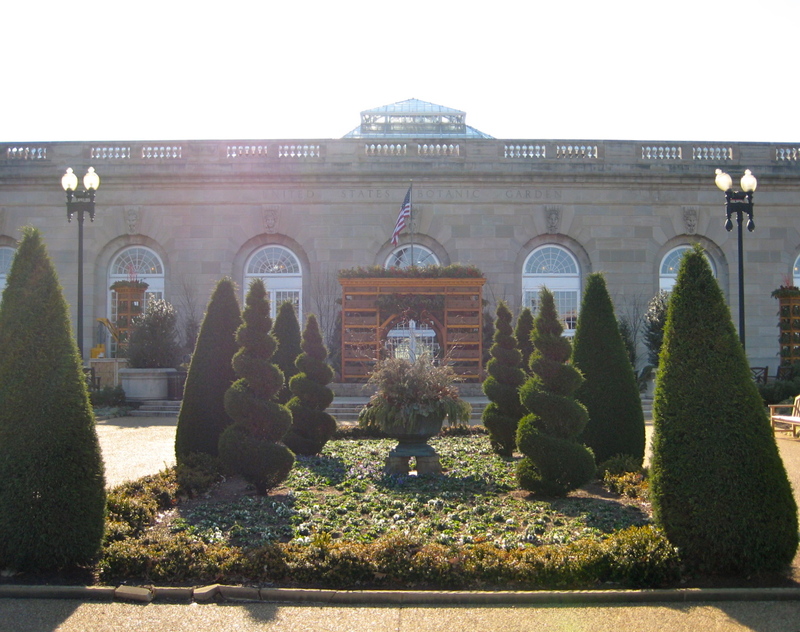 Winter is a strange time of year to visit the U.S. Botanic Garden, you say? I couldn’t disagree more. It seems to me that there is no better place to be on a cold January morning than the USBG Conservatory – it’s nice and warm. Granted, the plants in the outdoor National Garden and Bartholdi Park across the street were not much to see, but the Conservatory was bursting with color and warmth. The Botanic Garden has been in continuous operation and open to the public since 1850. According to its literature, the USBG maintains about 12,000 accessions comprising more than 60,000 plants for exhibition, study, conservation, and exchange with other institutions. I liked the Conservatory’s floor plan. I walked into the Garden Court, where visitors will find a variety of plants used in commercial products – including spices. (You see, the title makes sense!) From there, I strolled through several other garden exhibits displaying plant life from around the world: plants native to Hawaii, desert climates, and jungles to name a few. And the temperature and humidity varied in each garden according to the plants’ needs. The air in the desert garden was quite dry, while the jungle air was thick with humidity. In some rooms, a light mist fell from overhead sprinklers. Seriously – I walked in with curly hair and by the time I exited, it was straight! 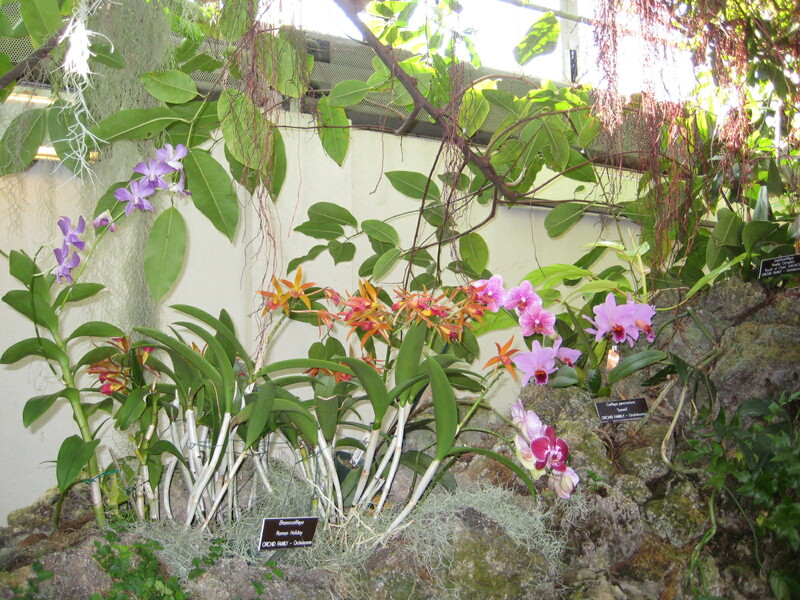 There are orchids, medicinal plants, and cacti in the Conservatory too. I really enjoyed looking at all the different plants, even though I didn’t read all of the detailed information. But here’s something that the USBG offers that I do like: many museums offer audio guides for visitors so that they can get a little more detail about the artwork. USBG does this too – but with a twist: your mobile phone becomes your audio guide. In all of the gardens, visitors will find small signs that list a telephone number (202 area code) and a “stop number.” If you want to learn more about that particular plant, you call the number on your cell phone and punch in the stop number when prompted. A recorded message provides all the detail you could ask for. You can also leave feedback by pressing another code when prompted. Maybe I’m out of the loop, but I’ve never seen that type of system in any other museum I’ve visited – have you? I thought it was pretty cool. So aside from the benefit of warming up my fingers and toes on a cold January morning, I think the U.S. Botanic Garden is well worth a visit. I’ll certainly want to check it out again in the spring and summer when the outdoor gardens will be in full bloom. The USBG is free, so it fits the budget. It’s convenient to Metro, and it’s located near the U.S. Capitol and right across the street from the Smithsonian National Museum of the American Indian – which you should also visit, because it is also very cool.